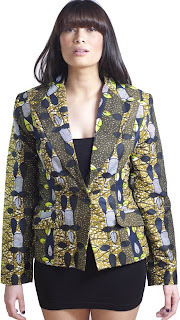 Me lovin' these African print Blazers from Raw Edge boutique. They are both designed by LORENZO DUFFLE'BAG DESIGNS a new fashion line on the block.lorenzo Duffle'Bag designs is Owned by Lanré Aluko-Olokun who is also a relatively new recording artist and actor based in the United Kingdom.The Designs are inspired by many things especially his Motherland *Africa- Nigeria. There will be a spotlight about this line very shortly ,so stay tuned and remember to incorporate an African aesthetic in your everyday look. Fabulous blazer!In love with your blazer dear!